Definition Early pathological contact between bony prominences of femur and acetabulum during hip motion due to a variety of morphological conditions leading to pain and chondrolabral damage predisposing the patient to early osteoarthritis of hip. • First described in 2003 by Prof Reinhold Ganz from Bern Hip Group, Switzerland. • Impingement may be intra-articular or extra-articular. • Abnormal morphology and / or motion is required for clinically relevant impingement to occur. • In addition a subluxating impingement also has been described by Leunig in 2001 in patients with shallow and dysplastic acetabulum. • Loss of normal head neck offset is the underlying cause. • The hump at the femoral head neck junction and the loss of normal concavity of the superior border of neck of femur is called pistol grip deformity. • Anterior hump causes outside-in abrasion of labrum and cartilage in the anterosuperior part of acetabulum on flexion and internal rotation. • Mismatch between femoral head and acetabulum leads to abutment of aspherical head and acetabulum rim leading to shear stresses which causes injury to the labrum and cartilage. • Chondrolabral separation, cartilage delamination and chondral defects develop leading to osteoarthritis. • Acetabular overcoverage is the underlying cause. • Overcoverage may be localized or generalized. • Overcoverage may be due to increased acetabular depth, abnormal version of acetabulum or localized bone overgrowth. • Leads to labral damage, ossification of labrum and cartilage damage over a circumferential narrow strip at the rim of acetabulum. • Impingement may lead to subluxation of head in the opposite direction leading to contre-coup cartilage lesions. • Young in their 20-40s. • Presents with groin pain in the sitting position. • Internal rotation and flexion are typically limited. • Anterior impingement test- Groin pin on forced internal rotation and adduction in 90 degrees of flexion. • Posterior impingement test- Pain on hyperextension and external rotation of hip. • Drehmann’s sign- Unavoidable passive external rotation on flexion (axis deviation) due to anterior impingement. • Anteroposterior and lateral views of the pelvis with both hips are taken. • Identify the abnormal morphology of acetabulum and femur. • Identify labral and cartilage damage. • Herniation pits or Pit’s pits are seen in FAI. • In cam impingement, the characteristic chondrolabral damage is seen in the anterosuperior part of acetabulum. • In pincer impingement chondrolabral damage is seen posteroinferiorly. ○ As positioning for x-rays can alter the measurements first ensure proper positioning of x-rays. § Posterior wall sign- Posterior margin of acetabulum lies medial to the centre of femoral head. § Cross over sign- Posterior margin of acetabulum crosses the anterior margin and the inferior part of posterior margin lies medial to the anterior margin. ○ Femoral head neck asphericity. § Alpha angle- Described by Notzli. <50 degrees. >55 degrees indicates loss of femoral head neck offset. Measured ideally on the radial slices taken along the axis of femoral neck. Angle between the axis of femoral head and neck and the line drawn between center of femoral head and the head neck junction. § Head neck offset less than 10mm. • Varus and valgus deformity of proximal femur may also may contribute to the development of impingement. • Torsional deformity especially of the acetabulum is an important cause of impingement. • Conventional MRI with orthogonal slices cannot fully visualize the labral and chondral lesions of FAI. 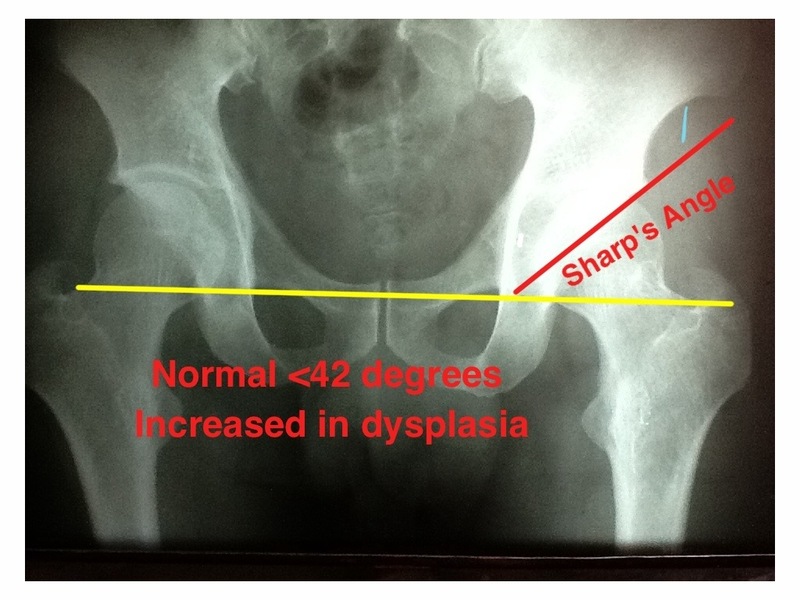 • MR Arthrography with radial slices is the gold standard for assessment of FAI. • Delayed Gadolinium-enhanced MRI of cartilage (dGEMRIC) allows quantitative assessment of chondrolabral damage. • Depends on the age and activity profile of the patient. • Asymptomatic individuals generally doesn’t need treatment. • If significant osteoarthritic changes are present then total hip replacement is the treatment of choice. • In the absence of OA changes; treatment depends on the type of impingement, location of impingement and degree of acetabular and femoral version. • Aim of treatment in cam impingement is restoration of sphericity of the femoral head by reshaping the head neck junction. • Cam impingement is treated by osteochondroplasty. • Isolated anterosuperior cam impingement can be treated by arthroscopy. • Cam impingement close to the site of entry of epiphyseal vessels, posterior cam and multiple pathologies need open treatment by safe surgical dislocation. • Safe surgical hip dislocation is the gold standard in the treatment of FAI. • Lateral approach through the Gibson interval between gluteus medius and gluteus maximus utilized. • Z- capsulotomy with preservation of labrum, short external rotators, pyriformis and the medial circumflex artery. • Anterior limb of capsulotomy is close to the femoral attachment of capsule and the superior limb is at the acetabular attachment of capsule. • Aim of treatment in pincer impingement is to reduce acetabular overcoverage. • Pincer impingement needs careful assessment of acetabular version. • Severe retroversion of acetabulum needs periacetabular osteotomy to restore normal anteversion of acetabulum. • If acetabular version is normal then pincer impingement is treated by rim trimming and labral reattachment.